These bars kind of make me feel like a kid again. 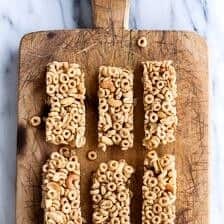 Not that I was ever a big Cheerios eater, but I did love those Cheerio breakfast bars with the “milk” in the middle that was really just pure sugar. They were really more like a dessert, which is probably why I never actually had them for breakfast. I was so close to trying to recreate those bars, and maybe someday I will, but I kind of wanted something a little lighter. Something still sweet and crunchy, but somewhat healthy too. Enter these super simple, eight ingredient bars (yes, ingredients that you can actually pronounce). Unlike almost all the store-bought snack bars that have about a bazillion ingredients that you cannot even read, or at least I can’t. I will be the first to admit that I am not the best reader, but I mean come on? Some of those words have to have been made up by a chemist. Thiamine mononitrate, disodium inosinate, pyridoxine hydrochloride, do we really want to put that in our bodies? I know I sometimes post some seriously indulgent food around here, but at least I know what the heck is in it. That’s better than the unknown any day. These bars are still sweet, but not overly so. They’re perfect for breakfast, snack or dessert. Well, dessert for normal people, but around here these little guys are a snack. It’s pretty much always chocolate around here when it comes to dessert. If by chance I make a non-chocolate dessert, that only means it will most likely need to be served with a side of chocolate. Speaking of chocolate, can I just say that I am so excited for Easter? Because I am. The other day my brain just started throwing out Easter treats like crazy. I am praying all the ideas work, but if they do, oh man! Chocolate sweets galore. Let’s hope all goes well. The one thing about these bars is that if you leave them in a warmish area the honey tends to get a little melty and the bars come undone. If you want to avoid this, try keeping them in fridge. I did not have any problems with my first batch because I cooked them just right, but I undercooked the second batch and they were a little loose. So just make sure to cook them properly and don’t freak if the honey bubbles up over the Cheerios while baking because it’s totally a good thing. Oh, and if they do end up crumbling a bit. These are milk’s best friend. Preheat the oven to 350 degrees F. Line a 9x13 inch baking dish with parchment paper. 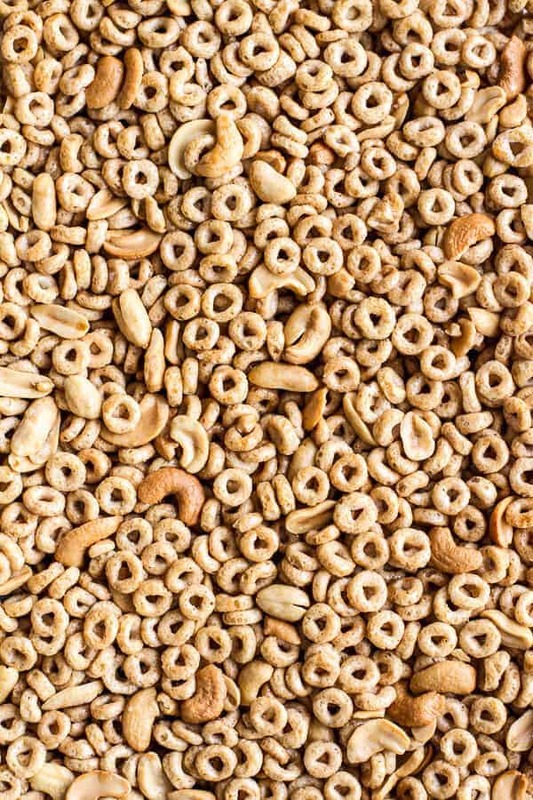 Add the cheerios and cashews to a large mixing bowl. In a microwave safe bowl add the honey, coconut oil and brown sugar. Microwave the mixture on 30 seconds interval, stirring until melted and smooth. This took me about 1 minute. Once the honey mixture is melted and easily pourable stir in the baking soda, salt and vanilla. Pour the honey mixture over the cheerios and toss well. Pour the cheerios out into the prepared baking dish. Bake for 25-35 minutes or until the top of the bars are golden brown. This mixture may bubble up a bit, but this is fine. Remove from the oven and allow to cool completely, about 2-4 hours before cutting into bars. Once cool cut in bars and wrap in plastic wrap for easy snacking. If bars end up crumbling use as you would cereal or granola. *If left in a warm place the bars will melt and crumble. I recommend keeping these in very cool and dry place. Ok, so maybe milk’s best friend is a warm chocolate chip cookie, but these could easily come in second. 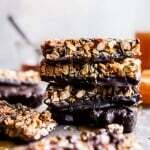 5 Ingredient (MAGIC) Matzo Chocolate Bars. 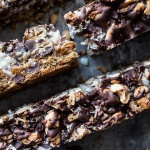 I’m always looking for a good cereal bar to try and these look perfect. I love that you added cashews! Speaking of chocolate…. these could easily be drizzled or dipped in chocolate. I will be making these very soon – have all the ingredients on hand – but I have to know – where did you get that awesome bowl? You can the bowl here. I have had it forever, like since before I started the site! HA! I am pretty sure I did not pay $28 though, so maybe shop around a little if you want it! Hope you love the bars! Love that blue bowl! These are so fun–can’t wait to see all the chocolaty easter desserts 🙂 Hmm…. Thanks Laura!! Loving your biscuits and am headed to you post soon! LOVE these and they look soooo simple to make! YAY! 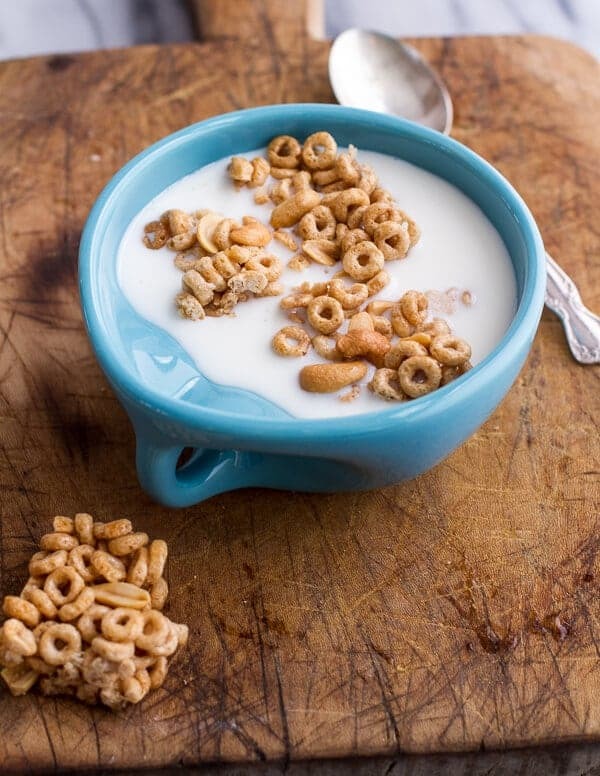 So fun…I love Cheerios and I had no idea you could buy them gluten free! Thanks Liz! Yeah, I have seen them at my local health food store! These bars look so simple, but so delicious. Like I’ve been transported back to childhood. I’ve got to whip up a batch soon! Thanks so much! Hope you get to make them and love them! Haha! No way, I can’t wait to see yours! Thanks Ashley! Yayayayay. 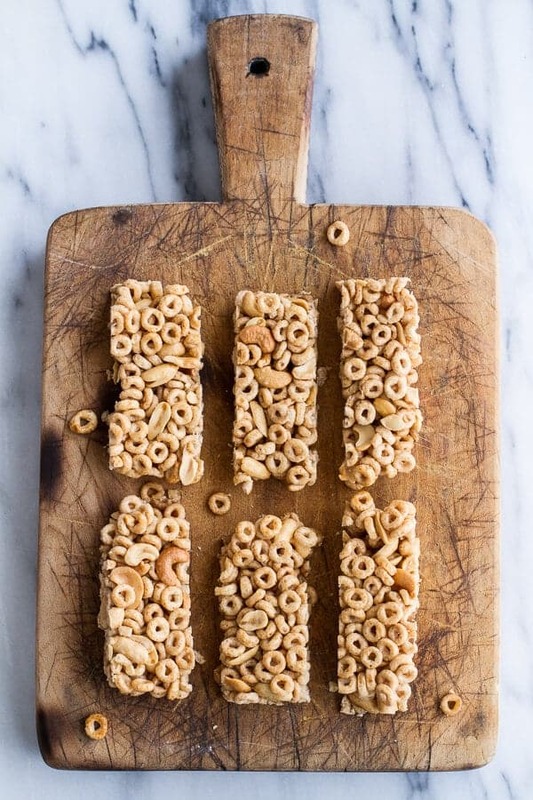 CHEERIO bars!! It looks delicious. But now I have to go buy myself a box of Cheerios haha. I don’t think frosted flakes would work very well. These are super creative. I love the bars floating in milk. Yum! Love this idea! 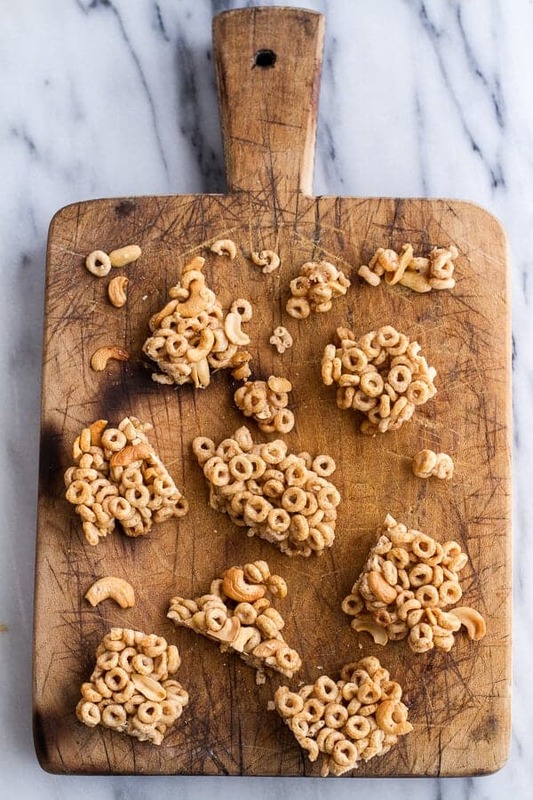 What a great snack to have on hand – my brother used to eat cheerios all the time and I’m sure he’d love these treats. I’ll never outgrow Cherrios! Sounds and looks delicious. Every time I see that little cutting board I swoon. Some time I hope you’ll share its history with us. I just know it has one. 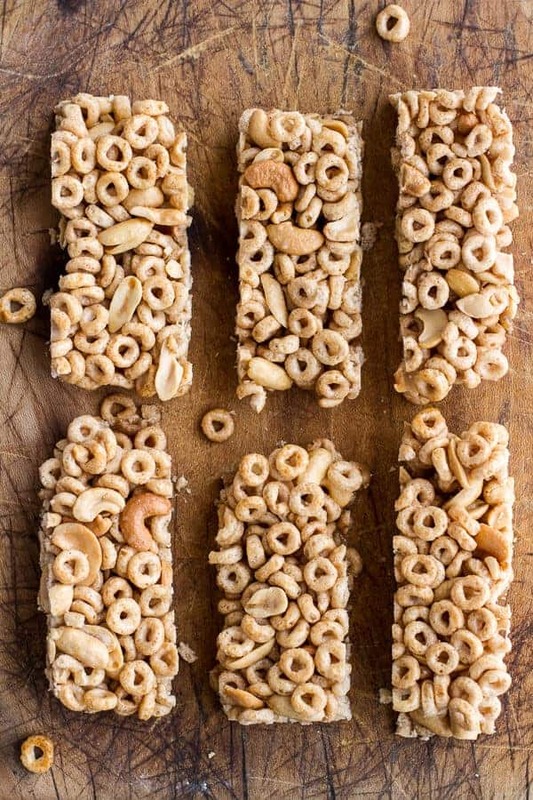 The Cheerio bars look great. Thank you so much, Maralyn!! I wish I had an awesome story to tell, but I actually bought it online. Sorry! Kind of a bummer. As a big time Cheerios fan (the multigrain ones are my favorite), these sound so good! Love the idea to crumble them up in milk if they start falling apart. They look great… like you I’m a chocolate person, so I’d probably drizzle some on top! Thanks Megan! And do the chocolate! These are perfect for breakfast-on-the-go! 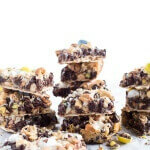 And I concur with the other gals….drizzle in chocolate, these would be dangerous! 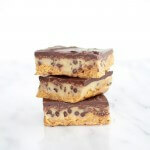 I’ve been on a serious cereal binge lately and definitely dreamed about making cereal-treat bars out of all the remnants of cereal in the half eaten boxes on top of our fridge…then, you make these! It’s basically a dream come true. Haha! What is it about cereal? It’s SO good!! LOL! These sound and look like such a delicious snack! And then the shot of them in the cereal bowl? It may almost be midnight here but I’m ready for breakfast! 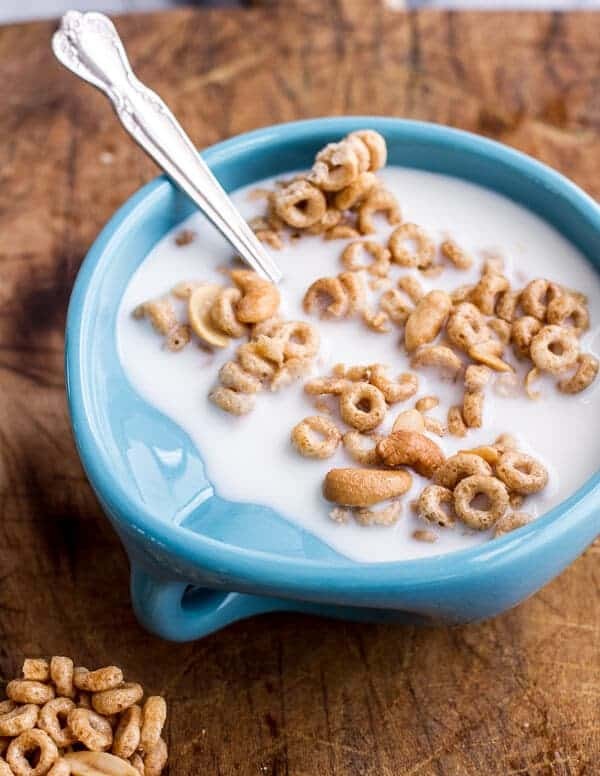 I have honey nut cheerios on hand at home…is it ok to use h.n.c. and add less honey? Hey Sally, I would still use almost all the honey as it helps the bars stick together. Maybe just use a scant 3/4 cup honey. Hope you love these!! And let me know if you have any more questions. Thanks! There’s a General Mills plant in town and whenever they are toasting the Honey Nut Cheerios, it’s the best smell on earth. These look like a must-make for my cereal-obsessed brother! No way!! That is pretty cool!! Yummy and so much fun! Our youngest daughter loves her honey nut cheerios AND cashews. I need to make these for a lunchbox treat! Yum! We make a version of these, but I can’t wait to try your recipe. 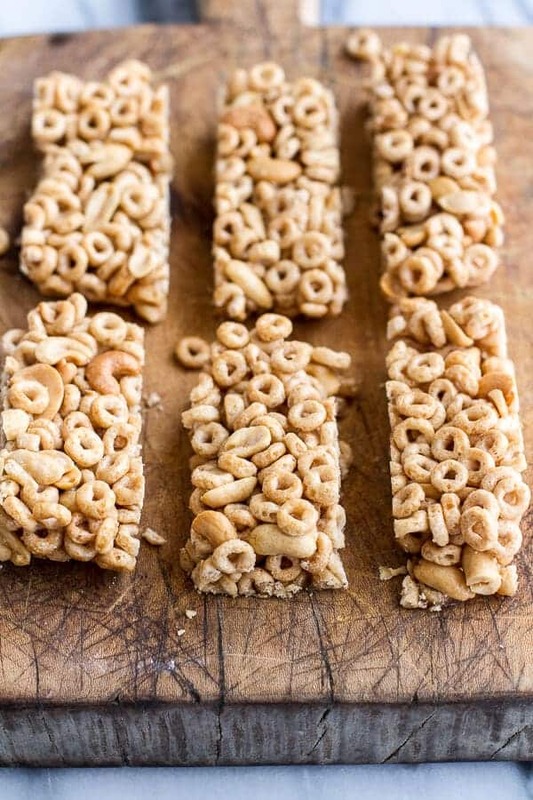 Honey nut cheerios bar is a great idea! By the way, what is the purpose of adding baking soda? Thanks so much, Cindy!! I think it helps keep the bars together. Hi – These look delicious. Could I leave the nuts out? Thanks Megan! And sure, no biggie! Hello Tieghan, just found you on Pinterest and saw you’re from Summit County (as am I). I’m enjoying your recipes and photos. I’m wondering if these might make great snack bars for carrying while hiking? (Usually doesn’t get REALLY hot up high.) I’ll try them – my Grands will be happy when they visit. Good luck to you! PS Like your Mom, I’m drawn to anything chocolate, so may have to drizzle some on top! Thanks so much, Barb!! These bars will be great for hiking, but know that they are very crumbly. Although, that drizzle of chocolate will help them stay together! Just made these. Mine were a dark, dark brown after 25 minutes. I think they might have burned a bit. They were definitely really hard to cut into bars as well. Do you know how long these will last in the fridge? Hmm, sorry yours got a little burnt. They will last at least a week, but I have kept mine for 2. Hope you love them! I just made these today and mine also got very, very dark after about 15 minutes, I think I took mine out at about 20 minutes and I also think they got maybe a little burnt (they still tasted ok though). Are you sure you only put 4 cups of cheerios in yours? It seemed like another cup would’ve been better. Mine were much, much darker than yours look. I used raw honey, maybe that made a difference? Hi! That could have made a difference, but maybe try tenting the pan with foil if they start getting too golden. Also, I am sure adding another cup of cheerios would be fine if you think the batch needs it. Let me know if you have any other questions and sorry for the trouble! Like the commenters above, my bars were very dark/almost burnt around the 15-20 minute mark. I haven’t tried them yet, but I’m sure they’ll taste fine. Next time I try them though, I’ll keep a closer eye on them and maybe not cook them as long or at a lower temp! Hi! I would try lowering the temp. Sorry for the trouble! Thanks and happy New Years!